Montclair Film is committed to making our programs and facilities available to all patrons so that your visit is as easy and rewarding as possible. It is our policy to maintain a working environment and a program exhibition environment free of all forms of unlawful discrimination. Montclair Film is an Equal Opportunity employer. All screenings and events at Cinema505 are handicap accessible from both the main entrance on Bloomfield Avenue and the lower level located on the bottom level of the Fullerton Parking Deck. The entrance to the lower level is regularly locked so please let us know in advance that you will be coming so we can be sure to have someone there to greet you at that door. There is an elevator to take you to the main floor. 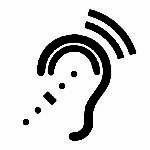 We also offer Assistive Listening devices for patrons upon request. For other venues during the festival and throughout the year, we work with venues to facilitate accessibility needs for patrons upon request. To request specific accommodations, we require that you contact us at least two weeks prior to the scheduled program. All of our programming, including the festival guide, is available on our website where you can enlarge and view it for better clarity. Wheelchair seating is available in all venues. Please note this seating option in the Comments/Special Instructions box during checkout, when purchasing your tickets. Upon request, most of our venues will provide wireless radio frequency hearing assistance receivers. See box office to request. Upon request, a certified ASL interpreter will provide a sign language-interpreted translation of conversations that are part of The Storyteller Series. Closed Captioning (CC) will be available for foreign films. Click here to see this list of films. Speech-to-text real-time captioning, provided by TotalCaption and Globetitles, will be available for download on your personal smart phone or tablet, which you can then use to read live transcriptions during selected conversations. Universal accessibility is an ongoing effort and we welcome your feedback so that we can continually improve our services and create the most inclusive experience possible. For accessibility related questions, please contact us at ADA@MontclairFilm.org.